ON SALE october 31, 2017! 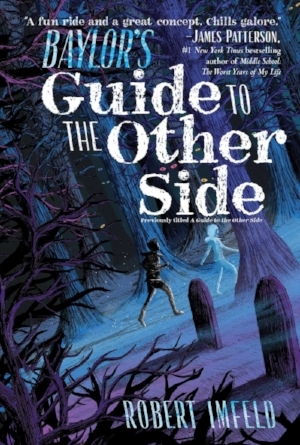 "A GUIDE TO THE OTHER SIDE IS A FUN RIDE AND A GREAT CONCEPT. A MIDDLE GRADE MEDIUM TAKING ON A VERY BAD GHOST, AND FINDING HIS TWIN SISTER—WHO’S ALSO A GHOST. CHILLS GALORE." "BAYLOR'S ADVENTURES WILL INTRIGUE, EXCITE, AND CAPTIVATE YOUNG READERS...THIS SERIES OPENER IS FUNNY, MYSTICAL, AND ENDEARING." "FANS OF ANYTHING OTHERWORLDLY SHOULD BE INSTANTLY ENTRANCED. VERDICT: A UNIQUE GHOST STORY LOADED WITH JUST THE RIGHT BLEND OF LAUGH-OUT-LOUD HUMOR AND SUSPENSE. ANTICIPATE HIGH DEMAND FOR THIS SERIES STARTER." "Where the Beyond Baylor series is heading is anyone’s guess, and plenty of kids will want to knoW. " There are a few things you should know about Baylor Bosco: He’s thirteen-years-old, he has a twin sister, and he really does NOT like ghosts…which is problematic because he’s a medium and sees ghosts everywhere. Oh, and his twin sister, Kristina? She’s a ghost too. FYI in case you need me, I'll be curled in the fetal position under my desk quietly singing along to @kelly_clarkson's "Move You" on repeat.